Definition at line 142 of file lluuidhashmap.h. Definition at line 172 of file lluuidhashmap.h. Definition at line 180 of file lluuidhashmap.h. References LLUUIDHashMap< DATA_TYPE, SIZE >::removeAll(). Definition at line 273 of file lluuidhashmap.h. References count, i, LLUUIDHashNode< DATA, SIZE >::mCount, LLUUIDHashNode< DATA, SIZE >::mData, LLUUID::mData, LLUUIDHashMap< DATA_TYPE, SIZE >::mEquals, LLUUIDHashNode< DATA, SIZE >::mKey, LLUUIDHashNode< DATA, SIZE >::mNextNodep, LLUUIDHashMap< DATA_TYPE, SIZE >::mNodes, S32, and TRUE. Definition at line 243 of file lluuidhashmap.h. References count, i, LLUUIDHashNode< DATA, SIZE >::mCount, LLUUIDHashNode< DATA, SIZE >::mData, LLUUID::mData, LLUUIDHashMap< DATA_TYPE, SIZE >::mEquals, LLUUIDHashNode< DATA, SIZE >::mKey, LLUUIDHashNode< DATA, SIZE >::mNextNodep, LLUUIDHashMap< DATA_TYPE, SIZE >::mNodes, and S32. Definition at line 226 of file lluuidhashmap.h. References count, LLUUIDHashNode< DATA, SIZE >::mCount, LLUUIDHashNode< DATA, SIZE >::mNextNodep, LLUUIDHashMap< DATA_TYPE, SIZE >::mNodes, and S32. Definition at line 361 of file lluuidhashmap.h. References count, i, llendl, llerrs, LLUUIDHashNode< DATA, SIZE >::mCount, LLUUIDHashNode< DATA, SIZE >::mData, LLUUID::mData, LLUUIDHashMap< DATA_TYPE, SIZE >::mEquals, LLUUIDHashMap< DATA_TYPE, SIZE >::mIterCount, LLUUIDHashNode< DATA, SIZE >::mKey, LLUUIDHashMap< DATA_TYPE, SIZE >::mNodes, LLUUIDHashMap< DATA_TYPE, SIZE >::mNull, NULL, and S32. Definition at line 186 of file lluuidhashmap.h. References count, FALSE, first, i, LLUUIDHashNode< DATA, SIZE >::mNextNodep, LLUUIDHashMap< DATA_TYPE, SIZE >::mNodes, LLUUIDHashMap< DATA_TYPE, SIZE >::mNull, NULL, S32, and TRUE. Referenced by LLMotionRegistry::~LLMotionRegistry(), and LLUUIDHashMap< DATA_TYPE, SIZE >::~LLUUIDHashMap(). Definition at line 305 of file lluuidhashmap.h. Referenced by LLMotionRegistry::addMotion(), and LLMotionRegistry::markBad(). 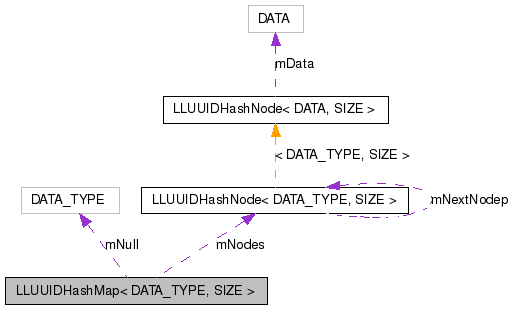 Referenced by LLUUIDHashMap< DATA_TYPE, SIZE >::check(), LLUUIDHashMap< DATA_TYPE, SIZE >::get(), LLUUIDHashMap< DATA_TYPE, SIZE >::remove(), and LLUUIDHashMap< DATA_TYPE, SIZE >::set(). Definition at line 161 of file lluuidhashmap.h. Referenced by LLUUIDHashMap< DATA_TYPE, SIZE >::remove(). Definition at line 159 of file lluuidhashmap.h. Referenced by LLUUIDHashMap< DATA_TYPE, SIZE >::check(), LLUUIDHashMap< DATA_TYPE, SIZE >::get(), LLUUIDHashMap< DATA_TYPE, SIZE >::getLength(), LLUUIDHashMap< DATA_TYPE, SIZE >::remove(), LLUUIDHashMap< DATA_TYPE, SIZE >::removeAll(), and LLUUIDHashMap< DATA_TYPE, SIZE >::set(). Definition at line 163 of file lluuidhashmap.h. Referenced by LLUUIDHashMap< DATA_TYPE, SIZE >::remove(), and LLUUIDHashMap< DATA_TYPE, SIZE >::removeAll().